Fifty-two people were killed and many more injured in Ethiopia's Oromia region during a protest at a religious festival, the government says. 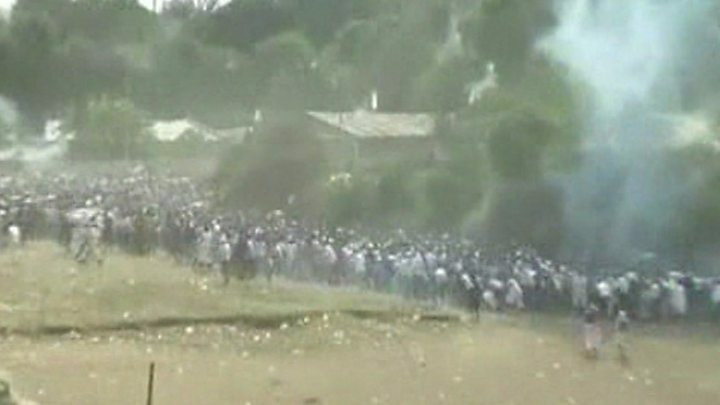 Some died in a stampede after police employed tear gas, rubber bullets and baton charges, witnesses said. Prime Minister Hailemariam Desalegn said rioters had caused "pre-planned mayhem" that led people to fall to their deaths in ravines. He denied reports that the security forces had opened fire. In a national address on state TV, he praised their "great efforts" to protect the public and blamed "evil forces" for the deaths, vowing to bring to justice those responsible..
Thousands had gathered for the religious festival in Bishoftu, 40km (25 miles) from the capital Addis Ababa. Some reports said police responded after anti-government protesters threw stones and bottles, but others said demonstrators were entirely peaceful. An Oromo activist, Jawar Mohamed, was quoted as saying that nearly 300 people had been killed and many more injured. He said troops and a helicopter gunship had opened fire, driving people off a cliff and into a lake. There has been a series of deadly clashes in Ethiopia in recent months. The US has expressed concern about what it termed the excessive use of force against protesters. What is behind wave of protests? Crowds at Sunday's Oromo festival, which AP news agency said had attracted two million people, chanted "We need freedom" and "We need justice", witnesses said. Some participants crossed their wrists above their heads, a gesture that has become a symbol of Oromo protests.